Siddaleah's Tarot Journal: Ah, Solitude. I didn't post yesterday's card because I didn't like it. Ha! 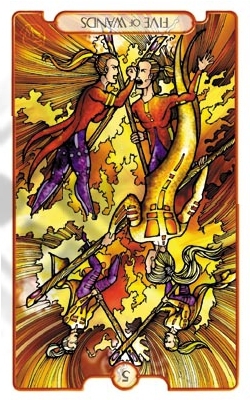 It was the Five of Wands reversed. It was probably appropriate. I had had a tiny spat with my husband the night before and was still feeling sulky in the morning when I drew the card. So, maybe it was saying something about conflict resolution, yada, yada, yada. I wasn't in the mood. It's all good now. I spent the day at the beach with my daughters and was too tired for arguing or for working it out when I got home. It was really a non-issue, anyway, just a lack of communication. This morning I drew The Hermit. I felt a sense of relief when I saw this card. This week, I've made a point of spending time with family, visiting my parents on Thursday and a picnic at the beach with my girls on Friday. And then earlier in the week I spent time with relatives who came over to help us build the deck, not to mention the whole fiasco with the decking material. Too many days in a row of going and doing and talking tends to tire me out. I deal with that by getting on the computer and reading or playing games. 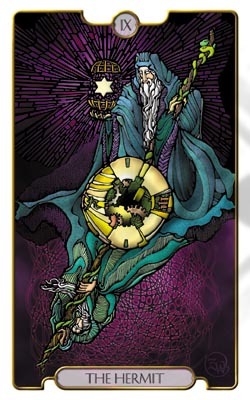 Today, The Hermit is telling me to get out by myself, away from the computer, to recharge my batteries a little. Maybe there is a better way to refresh myself than just adding more noise in my head via computer games and social media. Maybe a walk would be good, leaving the iPod and headphones home, leaving me alone with myself. And hope you had a lovely, calm walk - nature is such a blessing and a balm.